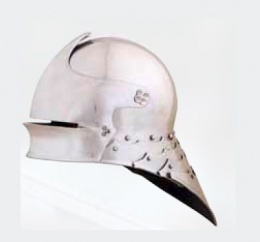 First came the bassinet which was replaced by the sallet helmet throughout Europe in the 15th century. This head gear provided a close fit with the exception of the back of the head where a tail was formed. In line with this, the German Sallet nicely reflects the late 15th century style in splendor. Forged 18 gauge steel, with a liner for comfort. This page was last modified on 4 May 2014, at 18:14.